I'm sitting on top of the world right now; at least it feels that way. As I gaze out over the hills of the butterfly valley I see the Kabak Bay in the distance covered by a mist of humidity so thick it's hard to distinguish between dream and reality, almost as if the mountains are floating on clouds. There is a slight breeze blowing up my way, from the Mediterranean, that keeps me from feeling the heat. The beetles' collective, harmonious melody enhances the enchanted ambiance. I feel like everything around me is calling out to pour my soul, to come out and say whatever it is I have been keeping hidden. If one has any kind of an artistic inclination, this would be the place where it would come out to life. This place has the kind of quality that would make you come face to face with your inner self because this is nature at its most intact form. It's almost as if the mountains call out to you and say "this is it, this is where you belong." Where is this place with the unheard of names and surreal atmosphere, one might ask? I am at the Tekkebasi Lodge, in the Alinca section of the Karaagac village of Esen, between Fethiye and Kas. This dreamlike place belongs to my cousin Erdem, who used to be a professional photographer and an editor for Atlas magazine. I have been meaning to visit for quite sometime and finally got the chance this week. We arrived here two days ago from Antalya. We took the Korkuteli road to Kemer (Fethiye) and at this intersection, turned in the direction of Kas. After going through the town of Esen, we followed the signs for Karaagac, Sydyma and entered a paved road for 10km.s. We found ourselves on a tiny dirt road in a little village and followed the right to find the 6km winding mountain road to Tekkebasi. This is a road that has to be taken in daylight for its perils and breathtaking views. We passed mountains full of pine trees and oleanders, with ancient water ways running down steep hilltops. As we ascended higher and higher the view took on a picture like quality. With each new turn there came a new prospect that stole the thunder from the former. After many twists and turns we noticed a little blue sign that said Tekkebasi Lodge. Our poor minivan persevered through this obstacle as well and brought us to Erdem's front gate. I knew we were at the right place when I looked out at the amazing view that was the same as the pictures I had seen previously on their website. We were greeted with ethnic sufi music and told to make ourselves at home on the makeshift wooden terrace hanging off the side of the mountain. When you sit there it feels like you become a part of the scenery, it's as if you're an eagle perched on top of a tree looking out over your terrain; you become aware of every little thing surrounding you, smelling the fresh oregano in the nearby hills, watching a dragonfly as it whizzes by, hearing the roosters crow, the village children playing in the distance. One feels the need to whisper here with a unique concern for disrupting the harmonious sounds of nature. It was time for the sunset and as the sun was touching the side of the mountains, making its final descend into the sea we felt a little bereft at being a part of such a poignant scene and then suffer the loss all too quickly. In the coming days we would learn to savor each moment so it wouldn't hurt as we would have to say farewell. It was time to take a little tour of the premises. As soon as I walked into my cousin's stone, cave like abode I felt like I walked into someone's dream. It turns out, he had drawn pictures of this particular place in his youth and when he found this spot during one of his travels he knew he had found the right place. He has built all the accommodations himself. There are several bungalows that are mere shelters for the ones who don't want to sleep out in the open and there is a traditional yurt tent with an opening in the top center to watch the stars as you lay to sleep. Everything feels like it belongs there, everything is one with nature. For those who want more comfort or privacy, there are two cabins that sleeps 4 comfortably, with all the modern amenities, situated within the forest, 200 meters away from the lodge. Time seems to stand still here, there are no hours in a day, days in a week. You live from sunup to sunset just existing as only one of God's creations. This is a place for peace and serenity. There is no distance long enough or no mountain high enough for the people of this area; I don't know if it's because of the challenging roads but they measure everything in matters of hours it takes you to walk there. 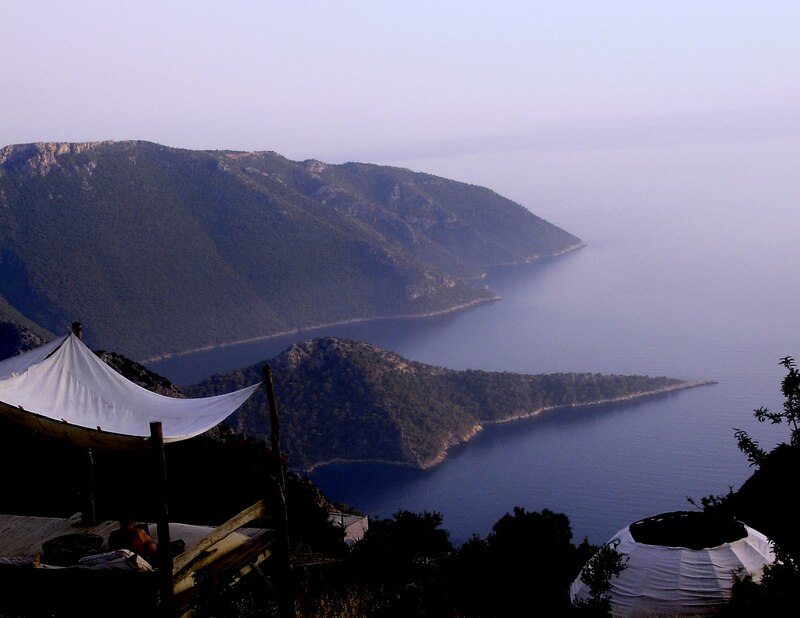 It is a great place if you're into trekking; it's right on the ancient Lycian way. There are some extremely interesting points to visit nearby. I choose to stay on the mountain until it's time to leave but it took my husband only one hour to get to Fethiye. This is not a place for a family vacation, at least not my family. I was extremely happy in those moments when the boys went to brave the roads to go to Patara to swim. So if you own a four wheel drive, love nature and want to find the place where you fit perfectly within, Tekkebasi Dervish Lodge is the place for you. I will be back with more travel notes in the near future. Hope you have a fun and adventurous summer.